January means one thing when you are a gardener: a mailbox stuffed to bursting with seed catalogs. 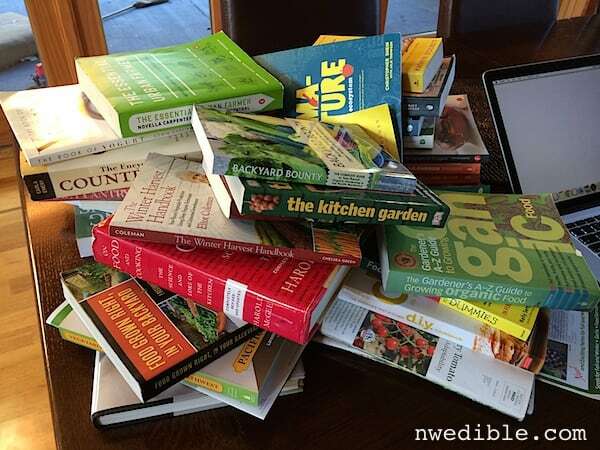 With a stack of seed catalogs and well-thumbed gardening books by our side, and ground that’s still too cold and wet to work, the name of the January game is mostly planning, not planting. 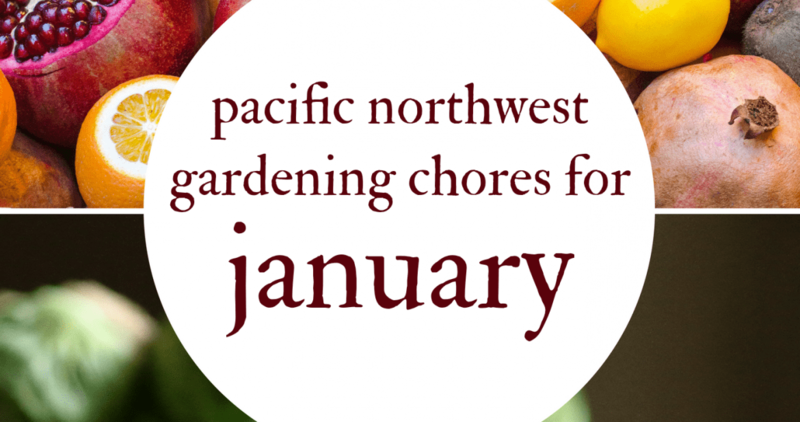 If you like your gardening chore charts simple and direct, you’re in luck! 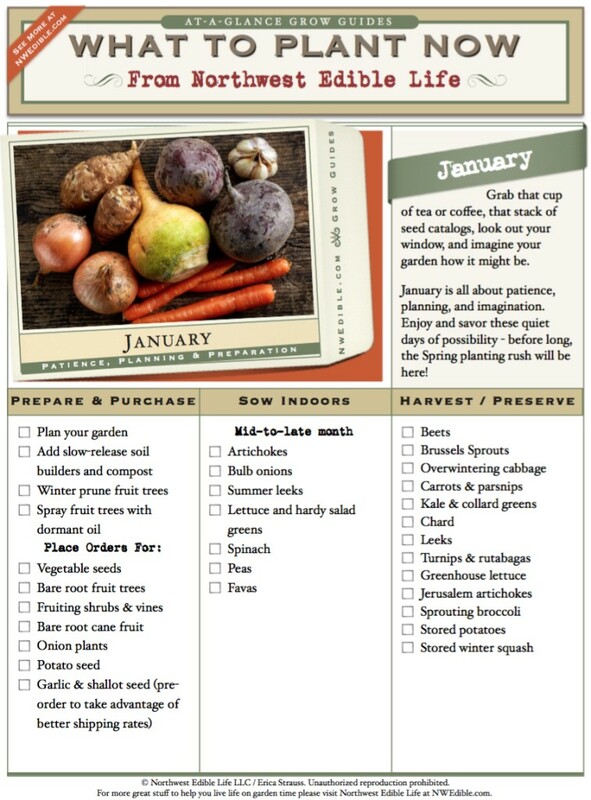 Just click the image below to download the January At-A-Glance Grow Guide as a printable PDF. 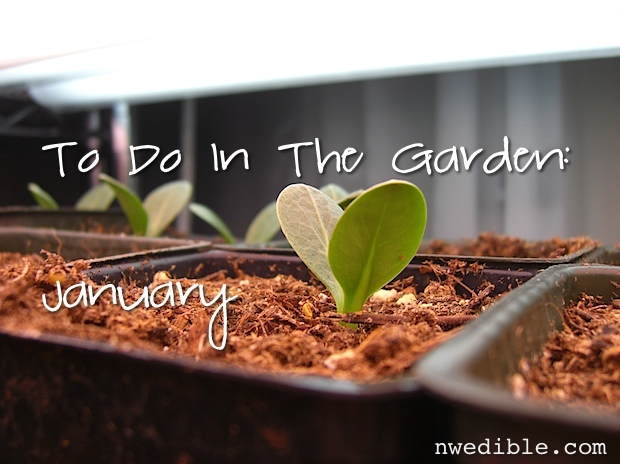 Or, continue reading for the full details on everything you should be doing – and not doing – in your garden this month. Click this image to open a printable PDF of this checklist. I like the dirty action (heh!) of hands-on gardening as much as the next girl but this is the time to stare out the window at your garden with a mug of coffee. In January we must hold back on action and revel in dreams and planning. Why real gardeners should imagine their garden’s vistas from the window. Be a very lazy garden planner. Enjoy seed catalogs, make huge fantasy seed lists, sketch out dream gardens, figure out where to put that next raised bed or pot. Take an inventory of your existing seeds, do germination tests as needed, and toss any seeds that no longer germinate with verve or those varieties that you don’t actually enjoy. Order the seeds you will want for this season. I like High Mowing Organic Seeds, Johnny’s Selected Seeds, and a bunch of smaller seedhouses. Try a new variety or several but don’t go crazy just because everything in the catalog sounds good. None of us has unlimited space or time. January and February are good months to place online orders for any bare-root fruit trees, bushes, canes or vines you might be adding to your garden this year. A good nursery will ship your plants to you at the right time to be planted in your area, before they begin breaking dormancy. I like Raintree Nursery for fruit and perennial edibles like that. Onion starts and potato seed can also be pre-ordered from general seed houses and specialty growers for delivery based on your region. Even though you might not get these things delivered for a few months yet, the availability of favorite varieties is great now. If you wait, you might be out of luck. It’s not too early to start thinking about soil. If you live someplace where the ground isn’t frozen or waterlogged, you can amend your beds with lime, slow-release organic fertilizer, compost and whatnot in preparation for the spring planting. If you aren’t sure what your garden needs, get a soil test. And don’t go plopping anything fast acting like blood meal on your soil right now – you’ll just be wasting nitrogen (and money!). Tackle dormant season pruning. Prune fruit trees for size, to remove crossing limbs, and to give the trees good air circulation and sun penetration. Spray fruit trees with dormant oil to control mites, scale and overwintering buggies. You can use a specialty horticultural oil, or make your own. 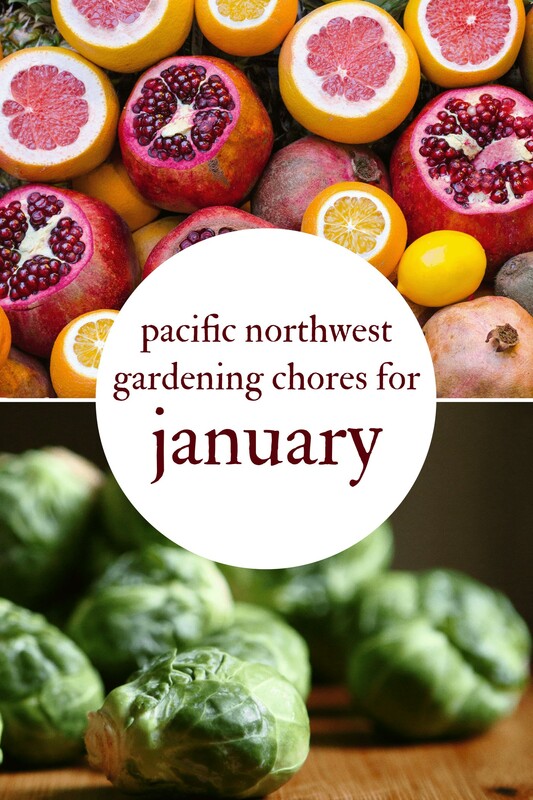 Mid-January is about as early as even the most crazy gardeners get seeds going under light in the Northwest. 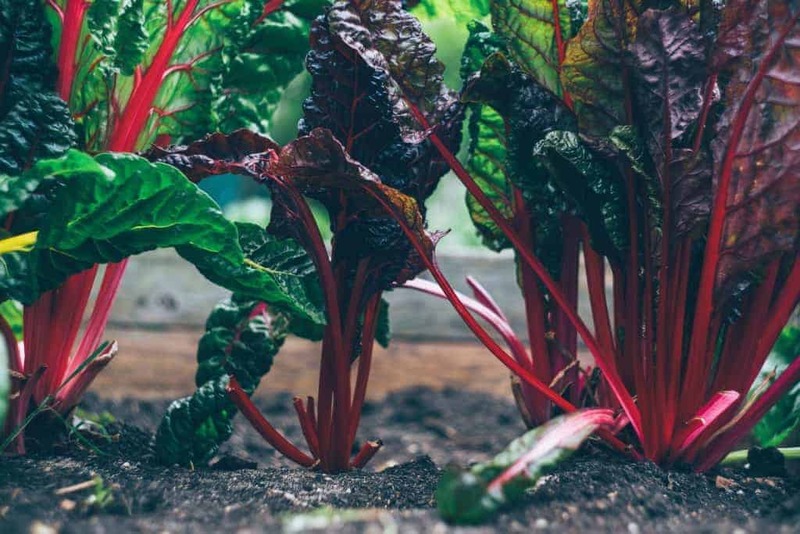 That’s still plenty early for hardy vegetables and long-season crops and if you start too early you risk some types of crops bolting before they grow big enough to harvest. Artichokes – My artichokes generally come through the winter, but when I need to replace them I sow seeds in 4″ pots mid-January. Onions and Summer Leeks – Use fresh seed, allium seed does not keep well. Salad Greens – From the end of January until mid-October, I’ll sow salad greens about every month or so. If you start lettuce under lights towards the end of January, you’ll be able to transplant out under a cloche at the beginning of March. If you didn’t get a bed prepared and cloched, keep those lettuces growing under lights and harvest them small right from the seed tray. Peas & Favas – most people sow peas and favas directly in the ground sometime between late February and April. If you want to get a jump on peas, you can start them indoors under lights as early as late January. Some years I start peas early I sow them in a section of plastic gutter which works well. Unless you practice Winter Sowing, there’s no sensible reason to sow anything outdoors in January. But a gardener in January can become a decidedly un-sensible creature. So let’s just for a second assume that not being outside in the garden is simply killing you. Here’s what you do. After you inventory your seeds for this year, collect up all the seed packets that aren’t making the cut because they are getting really old or aren’t your favorite varieties and make a “kitchen sink” seed blend to just play with. Mix in anything leafy – a random few sad old seeds of lettuce or spinach or beets or chard, plus arugula, kale, cabbage, cauliflower, radishes, etc. Now you have a guilt-free mesclun-style blend and if one of the varieties doesn’t germinate at all, who cares? Sow pretty thickly and if we get on of those freak February warm spells (hey, it could happen) you might be rewarded with an early crop of greens. How’s your garden planning going? Are you planning any changes or expansions this year? Thanks a bunch, Erica, (again) for doing all the work!! I’ve bookmarked and reviewed your past blogs on pre-warming, protecting planting spots, using Wall o Water, plastic, etc., and I just had an idea. I like a glass of wine or two per day…. medicinally, only, therefore ‘reds’ 🙂 …and find that on-sale box wines are cheapest and can be bought for just twice the price of soda pop, speaking generally. This leaves the inside bladder with spout/valve to consider. It holds 5 liter …. why couldn’t it work like a ‘hot water bottle’ (i.e., flat WoW’s ? Sun will warm the water, soil, and water is the best thermal mass for holding heat, as I understand it. Hmmm.. I just had to laugh! Good luck! For soil amendment, etc, I want to give a shout out to Tacoma gardeners who may not know about Tacoma Water’s TAGRO MIX – free (40% @ sawdust & biosolids, 20% sand), and TAGRO Potting Soil – $5 for about 5 five gallon buckets (same but no sand). Good stuff .. check out their website. Also, Raintree Nursery is great, but I’ve also used Burnt Ridge Nursery (also near Morton), with good success. My thought with using the bladder-in-box is that you’re going to reduce the amount of solar radiation that gets absorbed by the water (in other words, the sun isn’t going to heat the water as much). I don’t know how much this’d actually be an issue in practice, but what’ll happen is that the sun will hit the black cardboard and warm it. The black cardboard will then re-radiate that heat in all directions…some if it “inside” to warm the bladder-o-water but some of it back out into the greenhouse environment directly. So you’d probably see more daytime heating but less of an overnight “reservoir.” This is one of those “consider the box of wine as a black body radiator” engineering thought experiment things, so I don’t know how much difference it’d make in practice, though. Can’t hurt to try. I am terribly, terribly jealous of people who can start planning on planting ANYTHING at this time of year, or who are capable of ‘overwintering’ anything outside. (Note to self: this summer, build garden boxes with cold frames and see if that can’t help cabbages survive until January…). We’re in Quebec. It is currently -12F, and is likely to continue being about that cold until early April, at the very least. Last frost tends to be in early May. And our garden is under a foot and a half of snow, and that probably won’t melt until late April. Seed catalogues next to the fireplace, though. That’s totally where it’s at. Same here. climate envy. However, I will start leeks later this month. They don’t need to be under lights, a long planter in a window sill did fine. Thank you so much for the DIY Dormant Oil recipe. I currently have 7 fruit trees on our property, with a plan of adding 12 more in the upcoming year. We are just now having a good freeze, so I’m hoping to prune the trees this weekend, and spray for the first time early next week. With so many fruit trees, you just saved us a small fortune! CORRECTION! After all my struggling with the box wine bladder, a much smarter person (kudos to LauraMae!) demonstrated that all the effort is not necessary 😉 Just open the valve and submerge the empty bladder in a large pot of water… it filled right up!! Wish there was a ‘like’ button! Was job searching online and screamed like the house was on fire…High Mowing Seeds is hiring!! I suddenly found myself actually consulting a map to see how far away they are (230 miles). Job is a apparently, a little too physical for me right now ( especially being a little more sensitive to heat than most folks) or I would have shown up on their doorstep the next day.